When you think about Japan, you think of samurai. When you think of samurai, you think about Japanese swords—katana. There is a katana maker in Kyoto that has continued the craft of creating traditional Japanese swords since their foundation. The name of the shop is Tozando. 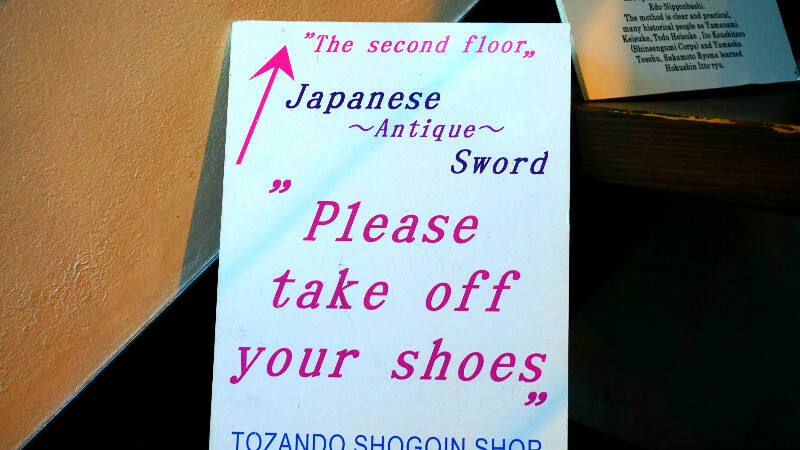 Tozando is a general manufacturer of samurai armor and swords, and has several branches in Tokyo and Kyoto, each of which specializes in a different weapon. Tozando Shogoin-ten is the one we are covering today. It mainly retails suits of armor, live Japanese blades, and practice swords with blunted edges. Tozando Shogoin-ten is located very close to the Heian Shrine, and is visited by a constant stream of international guests every day. What draws people through the doors of a store that stocks only expensive katana, armor and weapons? The products are so beautiful, they just seem to pull people in. Tozando has a great lineup of weapons such as high-quality in-house imitation swords, realistic sets of traditional armor of such quality that they are sometimes used in historical TV dramas and movies, and many other exquisite accessories for sword aficionados. Even in Kyoto, the cultural capital of Japan, there are few specialty shops with such an abundance of samurai products. You can sense Japan’s rich history in the flesh inside the store which was converted from a traditional townhouse built over a century ago. At Tozando, you can also pour over antique swords and arms manufactured centuries ago in the early Edo and Muromachi periods. If you are visiting the Heian Shrine, why not pop into this samurai culture oasis? Tozando lets you experience Japanese history in the flesh. There are many replica swords on display in the first floor of the shop. Although replicas, their beauty and sharpness are very real, and they glisten in the light like beautiful works of art. Unsheathe one and feel its power. Why not strike a pose and take a photo. Tozando’s replica swords are made in-house by craftsmen. As such, the quality is second to none, but the cost is outrageously inexpensive at around ¥28,000. These beautiful swords are representative of the spirit of Tozando, and the attendants will be only too happy to take them from the display cabinets to show you. These sets of body armor with a stately black sheen will put you in touch with feudal warlords who lived nearly 400 years ago! On the second floor, you will be welcomed by the sight of a mini army of imposing sets of samurai armor. These are full-scale suits of armor and have to be seen to be believed. They are exact replicas of the armor worn by the valiant warlords of the Warring States period 400 years ago! So imposing and realistic are the sets, they will send a shiver down your spine. Why not connect with the famous warlords who fought in and around Kyoto centuries ago? You can at Tozando. At Tozando Shogoin-ten, you will find an extensive collection of decorative sword guards known as tsuba, designed to protect the hands from the razor-sharp katana blades. Although produced with very practical reasons in mind, over time they became highly individualized and considered as pieces of fine art rather than just equipment for war. Actually, the beautiful designs on the tsuba cannot be seen by the holder of the katana, and were meant to be visible only to the opponent. This was to demonstrate one’s status as a samurai, so considerable effort went into making them look stunning. You can sense Japan’s unique aesthetic beauty in these pieces. In recent years, the beauty of their myriad designs has been recreated in products such as coasters and cellphone straps. Although it may be difficult to carry out their original purpose, you can use it as you like. Even if you don’t have a sword, tsuba make great decorations for all sorts of things. Normally family crests are exclusive, expensive items. At Tozando, family-crest stickers can be purchased at reasonable prices! They are usually placed on weaponry, but why not attach one to iPhone, notebooks, file folders, or anything that you want to and make your own samurai goods. Family crests are essentially traditional Japanese coat of arms passed down through families since antiquity, and were painted on armor and flags when samurai went to war. Each sticker is sold at the highly affordable price of ¥540, and make perfect souvenirs. The second floor is a gallery-like space decorated with sets samurai armor and katana. Keep in mind Japanese manners when entering a traditional Japanese room like this. Take off your shoes first. Please let an employee know first if you want to take photos. This is a shop in the Okazaki area of Kyoto that retails awesome-looking samurai paraphernalia such as body armor and swords. When I went there, one of the shop attendants showed me an unsheathed katana. It was incredible as it reflected the light in my eyes. This, I thought, is what “Cool Japan” is all about! Not only do they stock classy sets of armor and katana, they also sell smaller items such as traditional daggers, knives, and family crest stickers. These are inexpensive and would make excellent gifts as mementos of your trip to Japan. 9-minute walk from Keihan Line Jingu-Marutamachi Stn. 14-minute walk from Subway Tozai Line Higashiyama Stn. There are staff who speak English and Spanish fluently. Shipping is possible to anywhere in the world, but delivery takes time because certain procedures are necessary to ship swords overseas. Please be aware that more than one month may be needed.